SuperFogeys - Fan Art: 8-bit Captain Spectacular by Tyler Heasley! 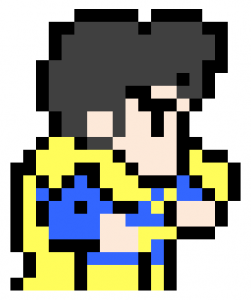 Fan Art: 8-bit Captain Spectacular by Tyler Heasley! Big thanks to my brother Tyler Heasley for this latest fan art! It made me laugh and brought me right back to the 6th Grade and playing The Legend of Zelda for hours on end. I’d love to see more Fogeys in this style! Apr 30, 2013 Fan Art: Zurida by Roland Perez! A second look at this strip reveals there’s a Garfield-look-alike plushie in the last panel, lol. I remember Garfield and other popular characters – usually bootleg Garfields and others if you know what I mean – always all over fairs and carnivals to win at their game booths when I went as a child. Wait, how did my comment wind up here instead of on the…? Oh, nevermind. This is a wonderful 8-bit Captain! I was trying to comment on Space Pig winning stuffed animals in Vegas.